And that’s basically what I’ve done here. 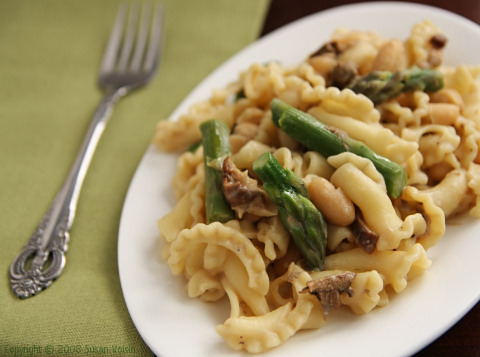 This sumptuous recipe makes use of seasonal asparagus as well as one of my year-round staples, dried porcini mushrooms. They’re great for adding a deep woodsy flavor to sauces, soups, and stews, and I particularly like the contrast of the fresh, green asparagus with the earthy mushrooms. Adding the porcini soaking water to the dish amps up the mushroom flavor, but be sure to strain it first; I’ve had dishes come out with sandy grit when the porcini juice hasn’t been filtered–not a pleasant mouth-feel! It’s not exactly ridiculously easy, but this recipe comes together fairly quickly when you cook the pasta at the same time as you do the sauce and asparagus. Pour the boiling water over the mushrooms and soak until they are completely rehydrated, about 20 minutes. Strain them through a fine sieve or a coffee filter, catching and reserving the liquid; rinse them if gritty and chop. Set aside. Meanwhile, cook the pasta in a large pot of boiling water until al dente. When it’s done, drain it, reserving 1/2 cup of the cooking water, and put pasta into a serving bowl. While the pasta’s cooking, blend the silken tofu, soymilk, and garlic until smooth. Pour it into a saucepan, add a pinch of nutmeg and the reserved mushroom liquid and simmer for 5 minutes. Add the lemon juice, sherry, reserved mushrooms, and the drained beans. Add salt and pepper to taste. Simmer until beans are warm. And while that’s cooking, steam the asparagus until tender but crisp, about 5 minutes. Add the asparagus to the cooked pasta and toss in the sauce. If it seems dry, add a little of the pasta cooking water. Add more salt or pepper to taste and serve. Nutrition (per serving): 330 calories, 15 calories from fat, 1.7g total fat, 0mg cholesterol, 31.1mg sodium, 643.2mg potassium, 63.1g carbohydrates, 7g fiber, 1.9g sugar, 16.4g protein, 9 points. We just bought a ton of porcini mushrooms and are dying to make your porcini creme sauce to use on some pumpkin gnocchi. It appears that the porcini themselves are not used (although they are chopped), or do you put them on top at the end with the asparagus? Oh no! No one’s ever pointed that out, so thank you for catching it. It’s been a while since I made this, but what I would do now is add the mushrooms at the same time as the beans. I hope you’ll let me know how it comes out if you try it. Soy is not my friend, any suggestions for tofu substitutes? A couple: you can use the same amount of white beans instead of tofu and blend them with 1/2 cup of any non-dairy milk. And if you don’t mind the fat, you can use cashews instead of tofu. Or you could use a combination of both. I had been looking all week for a special recipe to make for an Easter Potluck. I wanted to use asparagus also as I love them too and they always make our Easter table special! This dish with the porcini sauce will be PERFECTION! Susan–This looks great….I don’t have porcinis but I do have shirtake mushrooms….those would work, right? The flavor is different, but they will work. I find shiitakis stronger than porcini, so maybe you should use a little less. Funny thing my daughter said to me today while out in a “vegan” restaurant for lunch. She said she thought vegan restaurants seem to be “trying to hard” and that cooking a vegan meal shouldn’t be about TVP and seitan and other processed fake foods. She said she likes plenty of the dished that I make, (mostly from your recipes, Susan), and why can’t the vegan restaurants just make simple dishes with real food. So kudos to you again, because my daughter, who is not following a vegan diet, is impressed with your recipes, as am I! Wishing we will see more eateries catch on, but until there are enough people that want to eat this way, I guess we will have to do it ourselves! Thanks for sharing your ideas all the time!